Nothing is more important to the success of any organization than its culture. During recent years, and particularly in business, the fulcrum of competitive advantage has continually shifted away from processes and systems, and toward people. While most managers know this intuitively, they struggle with how to create a culture where employees do their best work. Lots of well-intentioned people are trying to help. But there’s a common problem. Our model helps explain it. When addressing culture, most consultants and gurus make one of two fundamental mistakes. First, they tend to focus on things like norms, rituals and values, asserting that a client can make progress by focusing on these things. The problem is that these things are outputs, and no amount of focus here produces lasting, meaningful change. 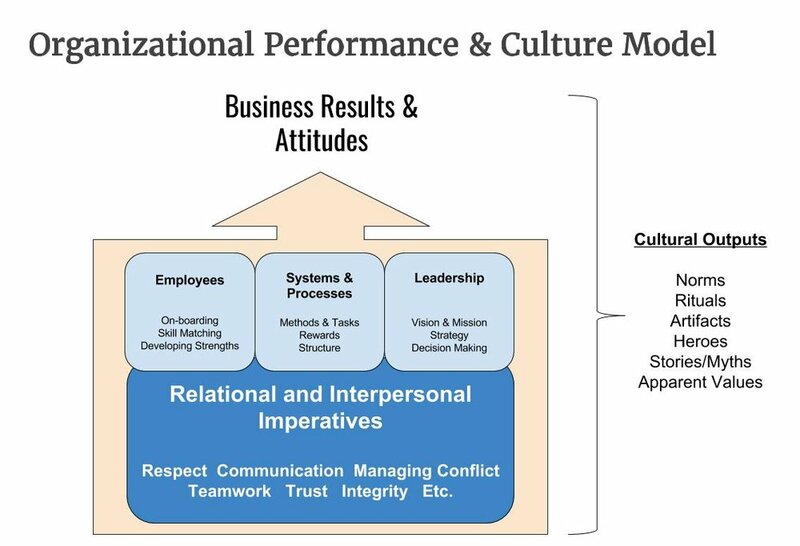 The second problem is that they assume that culture flows from things like systems, work processes, decision making models, structures, and similar organizational elements. To a certain degree this is true, but the core issue of culture is rooted much more deeply. Properly understood, culture results from foundational, interpersonal relationships and how people interact with each other. To truly address culture, we must first get to people and how they interact every hour of every day (the deep blue part of the model). This is the water in which leaders, employees and systems swim. It’s here that we find the magic ingredients of culture, which are relational and interpersonal skills. These relational and interpersonal skills are the bedrock imperatives, the prerequisites for an effective, top performing culture. The truth is, if we get these foundational elements right, the rest of culture building is relatively easy. If we don’t have it right, all the work in the world on things like systems, rewards and leadership (light blue areas in the model) won’t make much of a difference.